LIPOSUCTION ISN’T WHAT IT USED TO BE, AS TECHNOLOGIES, TOOLS AND EQUIPMENT HAVE MAJORLY ADVANCED. Any time plastic surgery is done, you can expect some level of pain. While what is experienced differs from one person to the next, most patients say there is soreness, tightness, itchiness and even mild burning post-procedure. There is also bruising, which can last three to seven days, or longer. Miami plastic surgeon Sean Simon, MD, says most patients recover pretty quickly from the procedure and o en return to work and normal activities in a short period of time. By day three or four (if not sooner), you can switch from painkillers to Tylenol to control any discomfort. “Most of my patients describe the recovery as more of a feeling of tightness and some soreness, but not excruciating pain,” adds San Antonio plastic surgeon Jorge L. Menendez, MD. THE RESULTS AREN’T INSTANT AND YOU WILL BE SWOLLEN. In the first 24 to 72 hours a er surgery, swelling sets in, which according to Houston plastic surgeon Michael Ciaravino, MD, occurs because of multiple passes with suction cannulas and the use of tumescent fluid (it limits bleeding and numbs the area). Dr. Simon explains that because the tissues are traumatized, an inflammatory reaction occurs that causes the tissues to swell. “There may also be swelling in areas that were not operated on due to this, as well as fluid retention.” Swelling can take up to a few months to go down, but, Los Alamitos, CA, plastic surgeon Juan Carlos Fuentes, MD, says most patients see 70 percent of the swelling subside by four weeks. To limit swelling, arnica and bromelain pills are o en advised before and a er surgery. YOU MAY LOOK WORSE BEFORE YOU LOOK BETTER. YOU HAVE TO WEAR A COMPRESSION GARMENT. Your plastic surgeon will have you wear a compression garment for a few weeks to up to three months a er surgery. “Compression garments help decrease swelling and allow the skin to lay at on the body,” says Dr. Fuentes. When liposuction is done on the stomach area, an abdominal board (a small, foam-wrapped board that helps flatten out the area) may be recommended, too. Oxnard, CA, plastic surgeon Dr. Yuly Gorodisky, adds that failing to wear your garment can cause your body to fill the empty space where fat once lived with fluid, leading to prolonged swelling and seroma ( fluid pocket) formation. “The compression garment reduces the empty space that has been created by the removal of fat,” explains Dr. Gorodisky. ALTHOUGH THE ACT OF REMOVING FAT THROUGH A CANNULA IS USED IN ALL TYPES OF LIPOSUCTION, THESE ARE THE MAIN ONES TO KNOW ABOUT THAT YOUR SURGEON MAY DISCUSS WITH YOU. This form of liposuction employs a laser, which is used under the skin to break up the fat so it’s easier to remove, and tightens up the skin, too. Using ultrasound on the area before the fat is suctioned out helps make the fat easier to physically remove from the body. This type of liposuction uses an oscillating cannula that gives the cannula extra power to dislodge the fat so the procedure is easier to control. LOOSE SKIN WILL STILL BE LOOSE, AND MAYBE EVEN WORSE. Liposuction doesn’t improve the quality of your skin, which is why your doctor should assess your skin during your consultation. “The ideal candidates are those who have localized areas of fat and good skin tone,” says Dr. Ciaravino. “Because the skin contracts a er liposuction, patients need to have good skin tone for the best result. A new form of liposuction, BodyTite, causes skin to contract more than standard techniques. However, liposuction is generally not recommended for those with very loose skin.” Some surgeons use laser-based machines like Smartlipo or SlimLipo on those with minimal skin laxity to help rm the skin. When liposuction is performed and there is still looseness that doesn’t require excision, skin- tightening treatments can help. YOU MUST MAINTAIN YOUR WEIGHT FOR PERMANENT RESULTS. 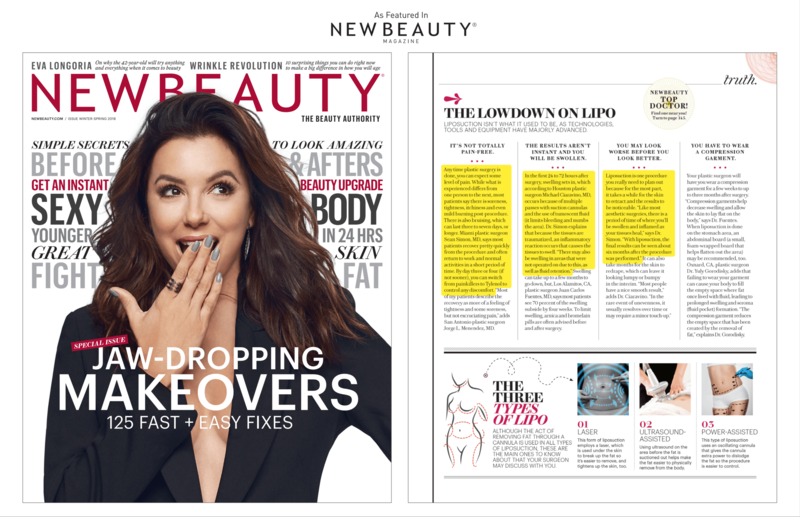 “Liposuction creates permanent change in the treated areas, but it’s not an excuse for bad habits and signi cant weight gain, which can negatively a ect the results,” says Dr. Simon. However, that doesn’t mean that any fat cells still existing in the area can’t swell and cause you to gain weight. “Liposuction removes fat that has been stored; it does not stop additional fat accumulation,” explains Dr. Gorodisky. “Once the number of fat cells has been reduced with surgery, the areas where the procedure was performed usually do not get as fatty as areas where it was not done. This is why some patients say fat migrates a er liposuction.” If weight is gained, the fat cells in the nontreated areas will increase in size, which can change the shape of your body. Look to lose inches, not pounds. Liposuction can remove up to five pounds of fat, but where you’ll see it most is in the way your body looks and how your clothes fit, not the number on the scale.